The kids are headed back to school, the summer flowers are fading and – here’s the big news – it’s no longer taboo to fertilize your plants in the fall. Now that we know more about the year-round development cycle of plants, giving them a boost in the fall with fertilizer may be just what they need to survive the harsh winter. Once it was thought that fertilizing in late summer and fall would cause a plant to develop new growth that would be damaged in the first cold snap. Scientists now believe that in the fall plants store food and nutrients in their root systems to help them survive until spring. Fall fertilizing can help strengthen a plant. Not all plants will need an extra boost of nutrients in the fall. Do a soil test to see what nutrients and minerals may be missing from the area you would like to treat. Many testing facilities will analyze the soil and give you their recommendations for the type of fertilizer to use. A common mistake with fertilizing is to assume that every plant will benefit from a dose. If the soil is healthy, then the plant may not need extra nutrients. Soil testing also helps to determine if an area has been over-planted. Remember – more is not better. Just replenish what is missing from your soil. Too much fertilizer can kill your plants or grass. All fertilizers have a three-numbered code or NPK code on the bag. This corresponds to the amount of Nitrogen (N), Phosphorous (P) and Potassium (K) in the fertilizer. In September apply a 20-8-8 mix fertilizer to your grass to help it recover from the summer heat and drought. Apply a 13-25-12 mix at the end of October to encourage root growth. For perennials, a high phosphate/low nitrogen mix will strengthen the plants and produce more blooms in the spring. Adding a phosphate mix when you plant bulbs this fall will help roots establish. Scientists have discovered that a garden is a year round living organism. Even though plants are dying above ground in the fall, there is a lot of activity going on beneath the soil surface. Roots continue to grow, storing nutrients from the soil. These nutrients help a plant fight off disease and strengthen the roots. When the temperatures drop to around 40 degrees, plants also release amino acids and sugars that help them withstand freezing. Keep your plants happy – fertilize! 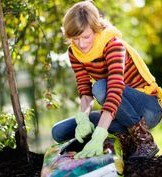 Good soil preparation, mulching and adding fertilizer where needed will keep your plants happy, healthy and thriving. Your garden feeds your body and your soul. Return the favor. Your plants will love you for it. Our expert staff is always on hand to help you with your lawn and garden projects. From a rake and a shovel to a wheel barrow and mulch, if you have any questions about what to choose, pricing or how-to’s, don’t hesitate to contact us. Stop by our store — we’re open seven days a week.